Artwork on the former John Hancock building could be finished today. Where, oh where, is the wall label? That’s the thing about public art, isn’t it? You never know where to look to have it all explained to you. But that’s also what makes it great. No one controls it; nothing can be wedged between you and the art. 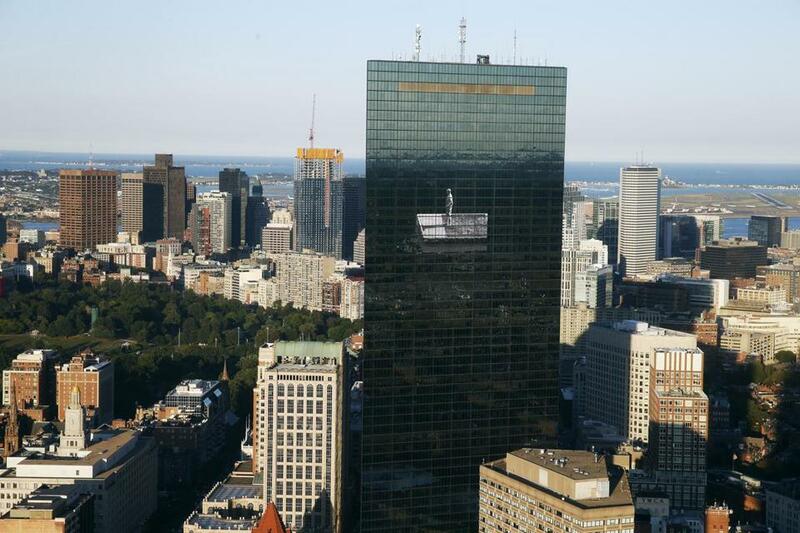 You can see the giant black-and-white pasting by French artist JR on the side of the former John Hancock tower in your lunch hour. You can see it from your car. Or you can see it, as I first did, from the other side of the BU bridge as you cycle along the Charles. Once completed, the huge mural will occupy window space between the 44th and 50th floors of the building, and will be 150 feet wide and 86 feet tall. JR, a street artist and impresario who, like Banksy, is determined to maintain his anonymity, has been pasting giant black-and-white photographs on walls all over the world for years now. His various visually arresting, socially minded projects have made him a global celebrity. I’m as confounded as anyone — including, I assume, the pilot of the helicopter that on Thursday was buzzing around the building like a hummingbird. And yet I’m already convinced that the piece has a little bit of genius about it. It’s unlikely, for starters, that JR has ever had a better canvas to work with. I’ve long believed that the building at 200 Clarendon Street, designed by Henry Cobb for I.M. 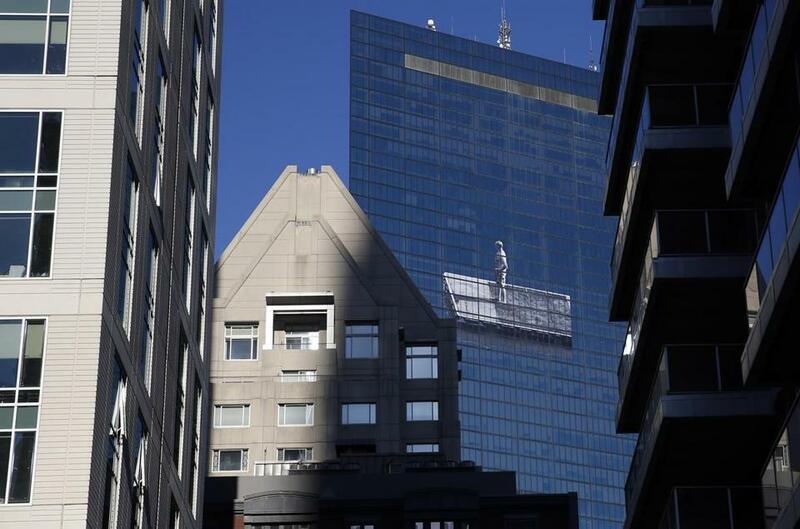 Pei & Partners, is the coolest man-made structure in Boston. (Yes, cooler even than the Citgo sign). With its smooth, sky-reflecting glass facade and its improbable, at times mind-bending geometry, it both cuts into the urban fabric around it and opens it up. With the simplest of means, JR’s pasted image (it’s made from perforated vinyl imprinted with a magnified photograph he took on his travels) does something comparable. The giant image shows a man in his shorts, half-turned away from the viewer, standing on some kind of horizontal structure. It’s niftier than it initially looks. It doesn’t just treat the building’s glass facade as a blank canvas. It uses the facade itself to bring the image to life. JR’s pasted image is made from perforated vinyl imprinted with a magnified photograph he took on his travels. On a clear day, like Thursday, the facade resembles a smooth blue sea. The image breaks its glossy surface tension with shadows and perspective lines that imply depth, a sense of receding space. And that, in turn, throws our own perceptions awry. Is the man, perhaps, on a raft, looking for land? That doesn’t feel right. Is he simply on vacation, preparing to dive in for a cooling swim? You can’t say. And, more than likely, you don’t want to say. The ambiguity is something your brain wants to hold onto. We’ll find out soon enough what the completed image looks like — weather permitting, it should be finished by 3 or 4 p.m. Friday, according to Pedro Alonzo, the Cambridge-based independent curator who has been working with JR on the project. More interpretations will follow. Right now, however, what it means doesn’t matter. That it works — as a visual conceit, as an image that can reel in the imaginations of thousands of people — is beyond doubt. Public art has finally been getting interesting again in this town of late. It began with the Dewey Square murals (the latest of which, by Lawrence Weiner, was officially launched on Thursday), and reached a climax this summer with the wonderful fabric sculpture by Janet Echelman suspended over the Rose Kennedy Greenway. And now this. With so many different players eager to get involved — not just the city and its partner institutions like MIT, the Museum of Fine Arts, and the Institute of Contemporary Art, but also real estate companies like Boston Properties Inc., and curators like Alonzo — it suddenly seems that Boston is vibrating with artistic potential, and anything might be possible. Sebastian Smee can be reached at ssmee@globe.com. Follow him on Twitter @SebastianSmee. Clarification: An earlier version of this article did not include complete credit for the design of the building at 200 Clarendon Street. It was designed by Henry Cobb for I.M. Pei & Partners.